Seasoning - salt and pepper to taste. Put jug onto boil for pasta. Put large saucepan on the stove over Low heat. 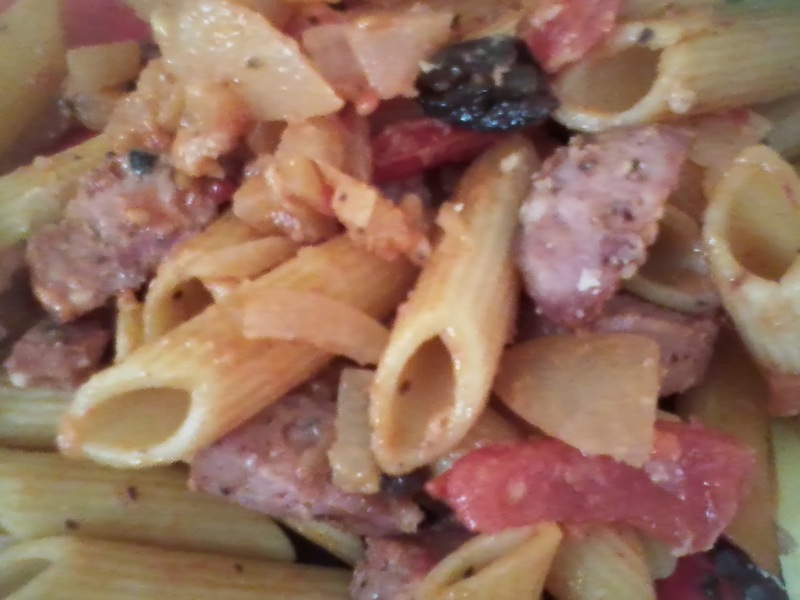 Chop onions, tomatoes, olives, sausage and grate the cheese. Place onion, salt and pepper in heated saucepan, fry gently for 2 minutes stirring twice. Add sausage, tomatoes, olives, Italian herbs, cook for 2 minutes stirring regularly to stop the mixture from sticking to pan. Tip mixture out onto a plate. Mediterranean Mixture done! Place pot back onto stove, pour in boiling water, turn up heat and add pasta. Add a pinch of salt and cook pasta for about 5-6 minutes - check by eating one, it needs to be firm but not hard to the bite. Pasta Done!